Vegetarian eggs Benedict has been a favorite family recipe for as long as I can remember. Soft, toasted English muffins, freshly sliced tomatoes and avocado, perfectly poached eggs and rich, buttery hollandaise sauce make this recipe ideal for lazy Sunday mornings or special brunches. We would almost always have it on Christmas morning – and even on a few evenings throughout the year. 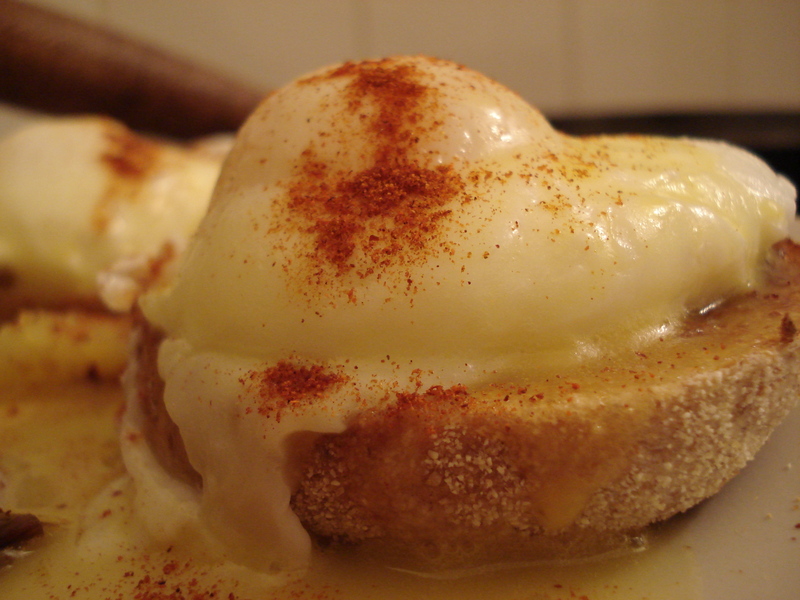 The secret to making eggs Benedict is timing. As a kid, I would survey the muffins while Mom would poach the eggs and one of my brothers would whisk the butter into the sauce. Back then, it was pretty much about team work. Thus my dilemma the first time I tried to make it all by myself in Pars. It’s taken my a few years to get the hang of balancing all the different steps and keeping necessary ingredients warm. This balancing act, in fact, has most recently led to an additional step and a thicker hollandaise than I grew up with back in Santa Fe. In order to keep my sauce warm one day when my eggs were a bit behind, I poured it back into the pan I had melted the butter in. Covered and away from the flame, there was just enough heat to keep it warm and thicken it slightly. Be careful though – if the pan is too hot or on a burner, the eggs will cook too much and you’ll get a yellow gooey mess. The fun part about vegetarian Benedict is that you can add any vegetables you like. We’ve tried it with almost everything, from steamed asparagus to sautéed mushrooms, from spicy guacamole to artichoke hearts, or even leeks! Whatever you use, prepare it before you dive into the eggs and sauce – these should be saved until just before eating. Since I grew up in a household where everyone knew how to make eggs Benedict, I never thought about an actual recipe until now. I’ve always made it from feeling – and this is probably the best advice I can give. I’ve done my best to give guidelines, but you’ll really just have to listen to your ingredients and adjust amounts and the order of the steps where needed. And, like I said, this one takes practice! Step 2: Put the bread in the toaster. Push the button just after putting the eggs on. Step 3: Begin preparing the sauce by separating 3 egg yolks and placing them in a small bowl. (You won’t need the whites for the hollandaise, so either keep them to poach or set aside for another recipe). Squeeze in the lemon and stir (this slightly cooks the eggs). Step 4: Poach the 4 remaining eggs by heating water in a deep frying pan and cracking the eggs into it when bubbles begin the form. Cook over medium-low heat. (Maybe it’s just superstition, but I always spread some butter at the bottom of the pan before adding the water.) They are ready when cooked on the outside and still slightly runny inside. Step 5: Push the button on the toaster. Step 6: Finish the sauce while the eggs are poaching by melting the butter and SLOWLY pouring it over the egg yolk/lemon mixture. Taste and add more lemon if desired. Keep warm as mentioned above. Step 7: Decorate the bread with a layer of veggies, the eggs and the hollandaise. Sprinkle with a dash of paprika, pepper, fresh chives … anything to top off your balancing act! Growing up, we ate eggs Benedict with orange juice – now I like it with a glass of refreshing white wine (at dinner time that is)! This entry was posted in Recipes (All) and tagged brunch, sauces. Bookmark the permalink.